Joseph O'Brien recorded his first official victory at The Festival™ presented by Magners following the success of the well-supported 7/2 favourite Band Of Outlaws in the G3 £80,000 Boodles Juvenile Handicap Hurdle. Ridden by J J Slevin, registering his second success at The Festival, the four-year-old son of Fast Company overcame trouble in the home straight to quicken clear in impressive fashion, scoring by two lengths. O'Brien, who steered Camelot (2012) and Australia (2014) to victory in the Investec Derby as a Flat jockey, was delighted to land another big-race winner in his burgeoning training career. The Piltown handler also saddled Rekindling to win the G1 Melbourne Cup at Flemington in 2017. O'Brien was responsible for the 2016 G1 JCB Triumph Hurdle winner Ivanovich Gorbatov, but the horse ran in his father Aidan's name because his license did not come through in time. He said: "I am delighted for Jason [Carthy, owner] and everyone. J J gave the horse a fantastic ride and we are over the moon. "We were fairly confident and thought he could be better than a handicapper. Band Of Outlaws has not done much wrong over hurdles, though in a handicap it is hard to know and he was carrying near to top-weight. "He is not an easy ride because you cannot get there too soon on him. It got a bit tight between horses and J J let them have the room before coming back around them, which was the right thing to do because as soon as he gets there, he has a look. "We thought we had a few chances yesterday. They all ran well, but it is nice to get a winner today." Gordon Elliott's Coko Beach (14/1) was in second, with a further length and three-quarters back to the Willie Mullins-trained Ciel Du Neige (17/2) in an all-Irish finish. Elliott commented: "Coko Beach ran well. I am delighted with his run." 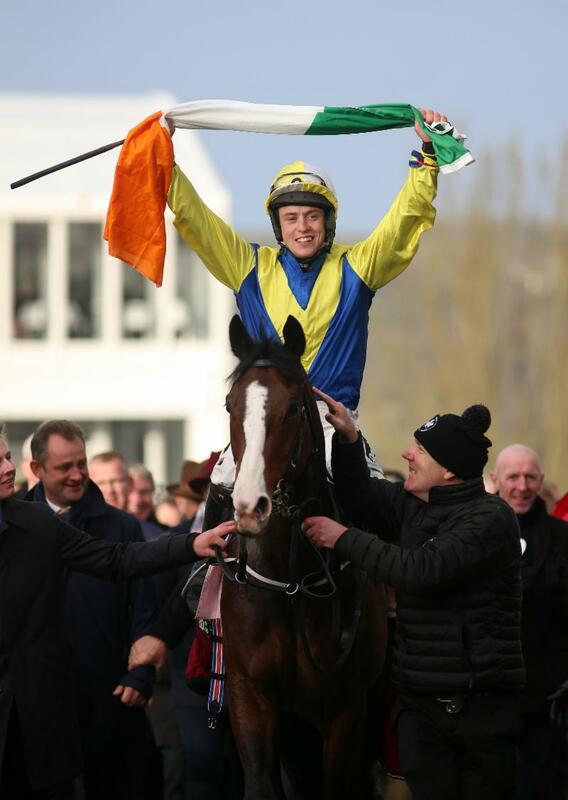 Coko Beach's jockey Jack Kennedy added: "It was a great run. He always seemed to be a nice horse at home and he showed that today." Just two years after his first Festival success on Champagne Classic in the Martin Pipe Conditional Jockeys' Handicap Hurdle, jockey JJ Slevin is in demand with the best trainers in Ireland and followed two seconds and a fourth on day one of the Festival with a two-length win on Band Of Outlaws (7/ favourite) in the G3 Boodles Juvenile Handicap Hurdle, his first ride of the day. Slevin, who won the 2018 Irish Grand National for Gordon Elliott on General Principle, had to take evading action when the Joseph O'Brien-trained Band Of Outlaws was short of room approaching the final hurdle, but he remained cool and said: "He's a very good horse and he doesn't like to be in front too soon. "The lads rightly closed the door on me and I had to go around them, but he got me out of a hole. "It's hard to be confident coming here, but I was lucky to be on the best horse. He jumps and travels and has always shown us a lot. You usually need a Graded horse to win these races and we are hoping he can step up. Aintree would suit him well. He shows loads of boot." Slevin, a cousin of O'Brien, added: "Joseph has given me loads of rides and helped me out so much. To do that for him means the world. He's a world-class trainer and nothing bothers him. It's unbelievable what he does, and he fills you with loads of confidence. "I never expected to be riding in these races. I was a point-to-point man back home and going nowhere for a long time. These wins are very special. "It was a first win in his own colours for owner Justin Carthy, who had a share in 2017 Grand Annual winner Rock The World with Michael Buckley."